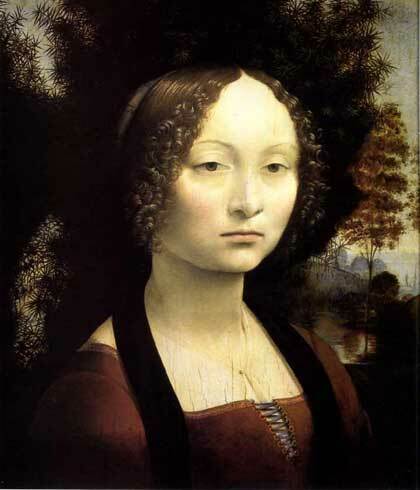 Leonardo's painting of Ginevra de' Benci was painted shortly after her wedding to Luigi di Bernardo Niccolini in 1474. 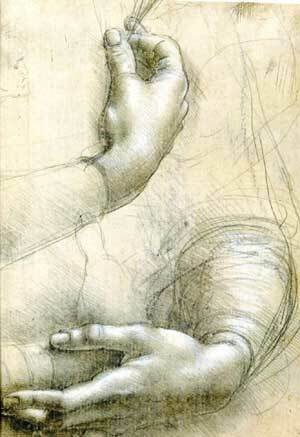 Part of the painting has been lost at the lower edge, and it is believed that a silverpoint drawing of hands by Leonardo is a study for the missing part of the panel. Vasari describes Leonardo's portrait as dating from about 1500-1506, but the sitter would have been in her forties and this seems unlikely. However the work would appear to be more accomplished than some of Leonardo's work from the same period, so the exact date of the painting is open to question. It should be noted that Da Vinci did frequent the Benci household and was a friend of the sitter's brother Giovanni. This was before Leonardo left Florence for Milan in 1482 and points to the portrait being painted before this date. Ginevra de' Benci, oil on panel 1476. The rather pale-faced portrait of is not due to any idealised considerations by the artist but due to the sitter’s rather sickly constitution. Leonardo has populated the middle ground with a large Juniper tree. The Juniper was a symbol of female faithfulness and virtue and it is used here to associate those attributes with the sitter. Even in this early work, da Vinci has included a landscape in the background of the picture, a practice he was to repeat in many of his subsequent paintings. The portrait is painted on the reverse side. 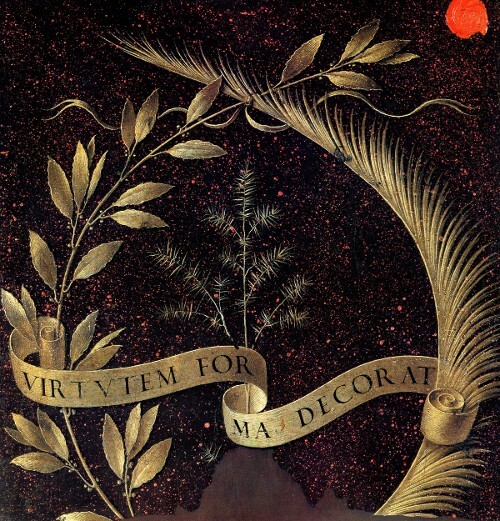 Laurel branches and palm leaves are interwoven with a garland displaying the message, Virtutem Forma Decorat: Beauty adorns Virtue. The message is very clear, Ginevra is expected to adhere to these high ideals of virtue and faithfulness, perhaps it’s not so surprising that she looks so ill! This sketch of hands would fit well with the missing panel from the painting! What a fine silverpoint drawing by Da Vinci!